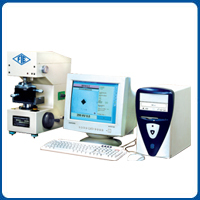 'FIE Computerised Microvickers Hardness Tester is a simple and accurate means to produce and automatically measure the diamond indentation to give micro hardness numbers directly. These testers are suitable for measuring the hardness of precision metallic parts with wide testing range - from soft to hard, and their accurate results are widely acclaimed. These testers strictly conform ti IS:1754:2002 and ISO 6507-2:1997. The machine frame is designed to accommodate the high precision loading system. Specimen is clamped by vice or supported by proper fixtures. The test cycle is fully automatic. The accurate load is applied on a diamond indentor by means of dead weights. After a lapse of time, the load is removed automatically. The image id digitallized using a CCD Camera fitted on the machine and is captured by the PC. 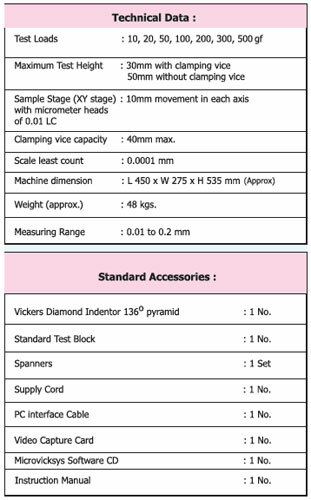 The diagonals of the indentation are measured by the PC and the Micro Hardness number is displayed directly on monitor. Fully Computerised (PC based) Micro Hardness Tester. 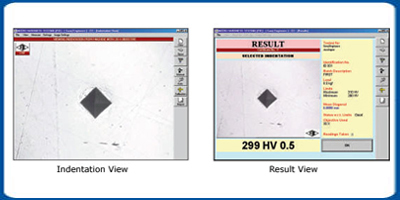 Direct and accurate measurement of micro hardness number using "State of the art" image processing technology. Wide testing range : From soft metal such as lead up to hardest, like hardened steel. Small size of indentation makes it a non destructive testing on finised components. Load slection by external knob. - Latest GUI features with user friendly software. - On line indentation setting and focusing on PC monitor. Batch File Processing : Option for data/ storage and reports generation for case depth analysis etc. 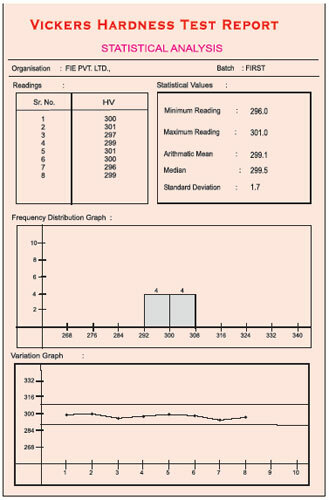 Statistical Evaluation : Software for calculating standard deviation, mean, medium, frequency distribution graph, variation graph etc. PC and Windows operating system is procured by customer. Minimum Pentium II with 64mb RAM & Window 98 / 98SE operating sytem required.